Introduction to Adobe Illustrator to modify simple shapes to create standout icons for your blog, forms, digital documents, interactive projects, and more. Adobe Illustrator project that uses a simple shape, a professional typeface, and color to create a striking monogram. Adobe Illustration experiment on how to apply brush strokes to objects, add texture, interest, and details to your illustration. Adobe Illustration of lions and manes teaching students how effects are a quick and easy way to manipulate shapes. Since effects are "live," you can return an altered shape to its original appearance afterwards. Learn how to create effects and experiment with variations. Learn how to create an eye-catching t-shirt graphic using basic shapes and Creative Cloud mobile apps. Adobe Illustration practice exercise to learn a new way to draw smooth, refined curves and straight lines. Adobe Illustrator assignment to design an eye-catching title for your next project. Adobe Illustration on how to capture a shape and convert it into a colorful graphic illustration. Digitize any image and use it to make Pop Art. Adobe Illustrator project on how to create a retro Halloween greeting card in Adobe Illustrator. It will include an easy to create pumpkin and a simple background. Use basic shapes and the Pen Tool. Adobe Illustrator project demonstrating use of shadows, pen tool, gradients, and other misc tools. 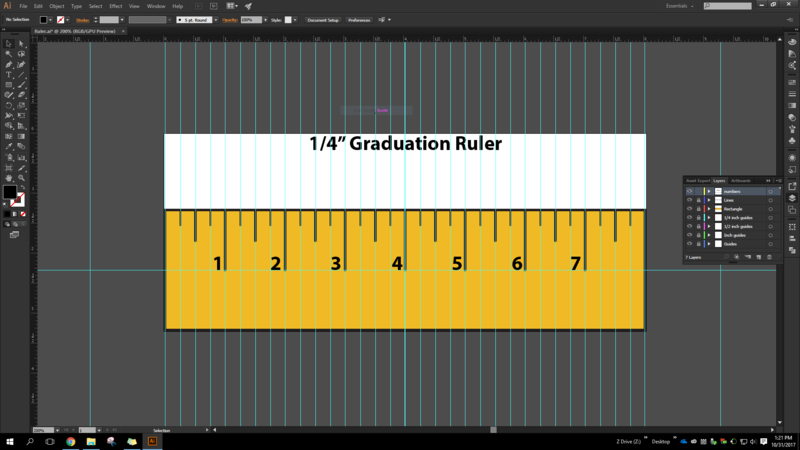 Hand drawn ruler in Adobe Illustrator. Demonstrates use of Shape and line tools including how to use guides and rulers. Adobe Illustrator project demonstrating knowledge of the software’s shape, line, paint bucket, & text tools while understanding color theory. Applying knowledge of color theory and basic Illustrator tools to create a unique and artistic color wheel. New tools added including pen tool. Adobe Illustrator project on how to draw a Thanksgiving Day turkey that focuses on the rotation and duplication tools, gradients, and simple shapes. Adobe Illustrator project demonstrating use of transformation tools including filters, distorts, and warps on text to indicate an understanding of typography vocabulary. ​Group project in which student worked collaboratively to create a mind-map describing basic principles and elements of design. Hyperlink included for viewing.